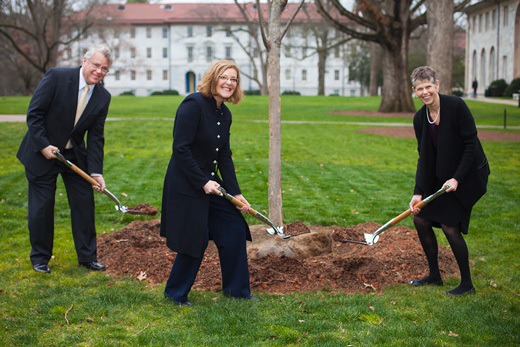 President Claire E. Sterk (center) was joined by Jimmy Powell, director of Engineering and External Services, and Bobbi Patterson, professor of pedagogy in the Department of Religion, to plant an elm tree on the Quad to mark Sterk's inauguration. More than 40 species of elm are native to the Netherlands, the birthplace of Emory President Claire E. Sterk. As part of Sterk’s formal inauguration program Wednesday, she planted the Ulmus Americana, or American elm, on the Quad. It is resistant to Dutch Elm Disease but related to the 75,000 varieties that cover Amsterdam alone. Sterk, Jimmy Powell, director of Engineering and External Services, and Bobbi Patterson, professor of pedagogy in the Department of Religion, installed the tree near Callaway Memorial Center. An American elm takes about 30 years to reach a height of 70 feet, Powell says. The life span for such trees can be 200 years or more. As it grows, it will provide more than 50 feet of shade and a burst of yellow on the Quad each fall, celebrating both Sterk and Emory's commitment to sustainability. Patterson read a poem, “Cultivate,” that she crafted for the occasion, which drew even more parallels between Emory’s first female president and the new hardwood.